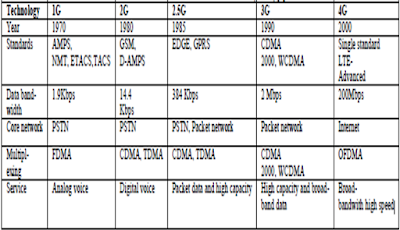 This article explicitly compares the 3G and 4G Network Technologies and other later technologies like 2G and also shows their differences and node of operation, the differences between 3G and 4G technology and their speed in tabular form as Long Term Evolution (LTE) technologies. • The quest for faster speed, improved QoS, lower latency and convergence of voice and data on a purely IP system to improve network resource efficiency has resulted in the emergence of the 4G network, gradually but surely eclipsing the 3G network. • The integration of new MIMO antenna technologies, OFDMA modulation scheme, IPV6 and simplification and flattening of the existing 3G architecture have made the 4G network a reality today. • LTE is the fourth-generation (4G) network and is the current generation of wireless communications systems. • Mobile service provision is facing important advancements towards more flexible business models, with novel and dynamic Internet-like services, with the introduction of new 2.5G/3G generations of mobile communication systems, like GPRS, UMTS and CDMA. • LTE was planned to encompass many wireless networking and cellular technologies including Wireless Personal Area Network (WPAN), Wireless Local Area Network (WLAN) and third generation (3G) cellular network. Internet Protocol (IP) is further introduced and utilized to seamlessly interconnect these wireless networking technologies on a backbone network. 1. Wired and wireless data connectivity (WLAN IEEE 802.11/a/b/g standards & xDSL). • These two networks when merged, creates a more robust superior network capable of delivering virtually all the benefits of the 2 networks. 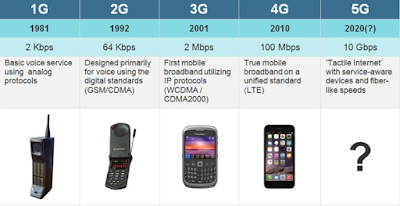 • The third-generation (3G) network was the first bold step en route a convergence between both networks. 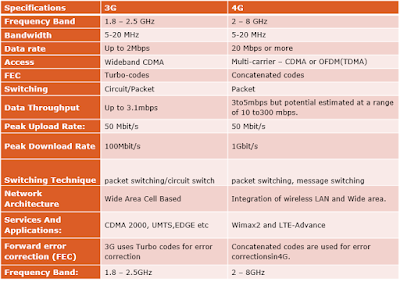 The two tables in the diagrams below show an overview of various telecommunication network technologies, year, standards, data band width, core network, multiplexing and service. • 3G performance is no longer sufficient to meet needs of high-performance multi-media, full-motion video and wireless teleconferencing applications. • High data speed demand. • 3G is based on primarily a wide-area concept. Hybrid networks that utilize both wireless LAN (hot spot) concept and cell or base-station wide area network design is required. • Demand for wider bandwidth. • Spectrally more efficient modulation schemes that cannot be retrofitted into 3G infrastructure are now available. Hence the need for a new generation technology. a. Reduce the number of different types of RAN nodes, and their complexity. b. Minimize the number of RAN interface types. • Reduce latency (which is a prerequisite for CS replacement). • Increase throughput and spectrum efficiency. • Provide greater flexibility with regard to the frequency bands in which the system may be deployed (Frequency Refarming). • Migrate to an optimized PS domain, with no CS domain in the core network. • Provide efficient support for a variety of different services. Traditional CS services will be supported via VoIP, etc. • Minimize the presence of single points of failure in the network above the evolved Node Bs (eNBs). • Support inter-working with existing 3G systems and non-3GPP specified systems in order to support handover to/from these systems. • Improve terminal power efficiency. 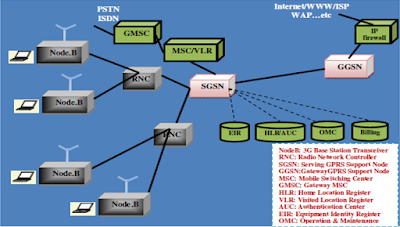 Below is the schematic diagram of 3G UMTS Network Architecture. 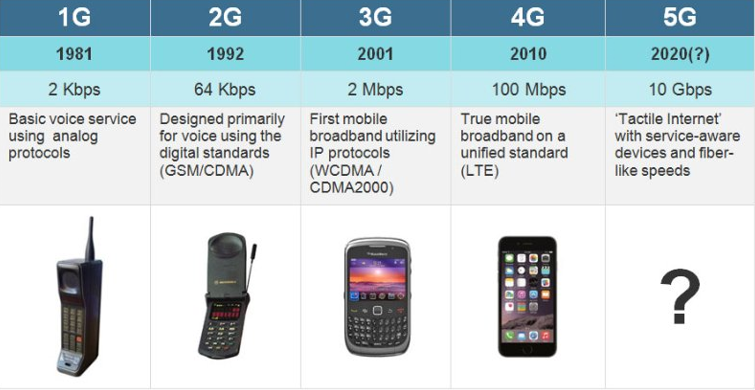 • The key International Mobile Telecommunications-2000 (IMT-2000) proposals are the MTS (W-CDMA) as the successor to GSM. UMTS licenses have already been awarded across Europe and Asia through 3GPP group. 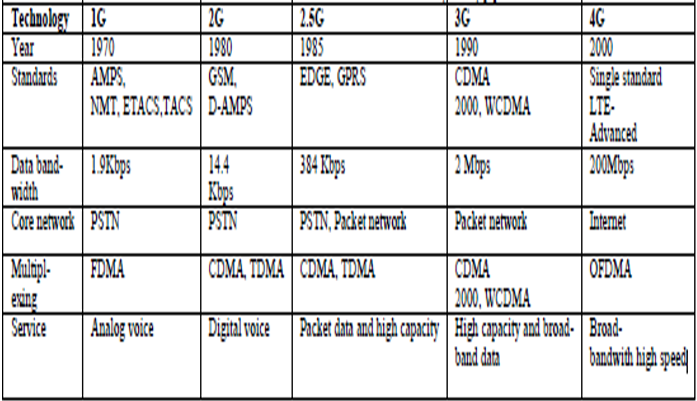 • UMTS differs from GSM Phase 2+ (2.5 and 2.75G) (W–CDMA instead of TDMA/ FDMA). • The air interface access for User Equipment (UE) is provided by the UMTS Terrestrial Radio Access Network (UTRAN). • UTRAN introduces two new network elements: RNC (Radio Network Controller) and Node B. • The circuit switched elements include: (MSC)/ (VLR) and Gateway MSC. • Packet switched elements are (SGSN) and (GGSN). • The first release of LTE (release 8) was labeled as “3.9G”. The goal was to provide a high-data rate, low-latency and packet-optimized radio access technology. 2. 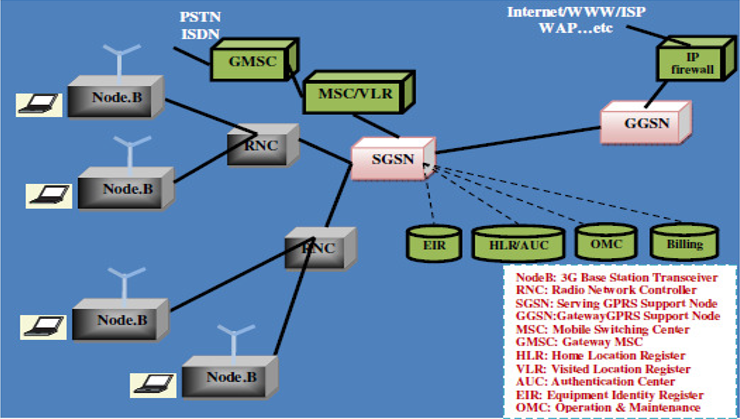 The packet data network gateway (P-GW). The diagram below gives the summary of the various network architecyure evolution. • 2 nodes in the RAN. • 2 nodes in the PS Core Network. • Every Node introduces additional delay. • Common path for User plane and Control plane data. • Air interface based on WCDMA. • RAN interfaces based on ATM. • Option for Iu-PS interface to be based on IP. • Separated path for Control Plane and User Plane data in the PS Core Network. • Direct GTP tunnel from the GGSN to the RNC for User plane data: simplifies the Core Network and reduces Signalling. • First step towards a flat network Architecture. 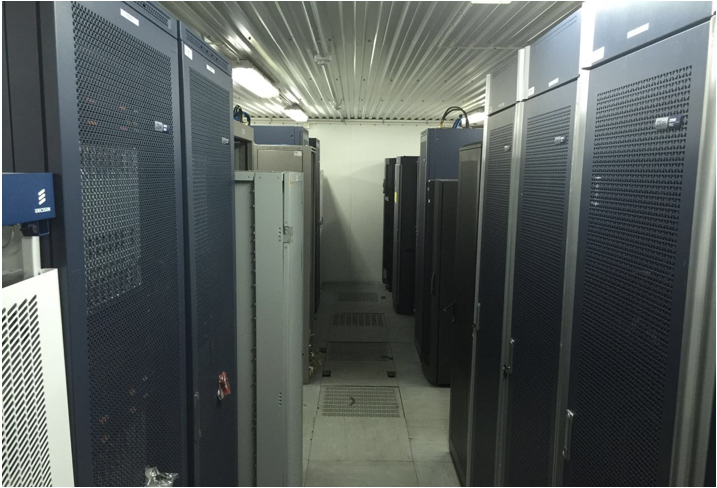 • 30% core network OPEX and CAPEX savings with Direct Tunnel. • The SGSN still controls traffic plane handling, performs session and mobility management, and manages paging. • Still 2 nodes in the RAN. • LTE takes the same Flat architecture from Internet HSPA. • Air interface based on OFDMA. 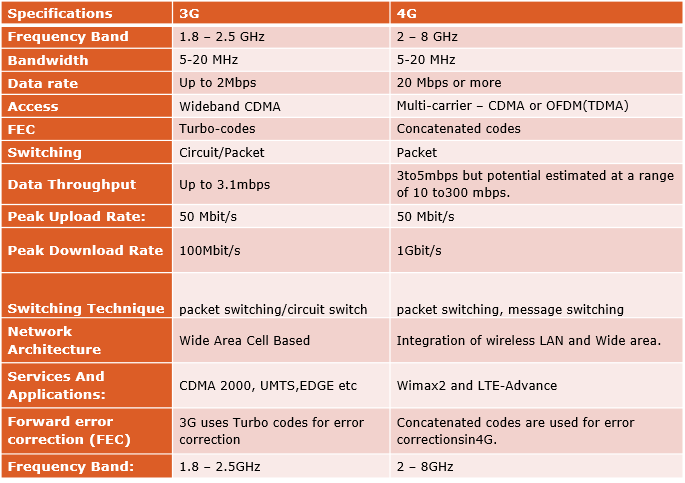 The table in the figure below shows a summary of the specifications and differences between 3G and 4G networks. • 4G networks handle broadcast quality data loads over much faster, cheaper, and more mobile connections. 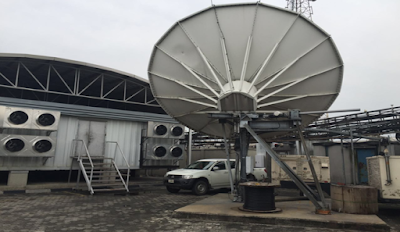 • Tele-geo processing which is a combination of GIS (Geographical Information System) and GPS (Global Positioning System) gives required location by querying. • Tele-Medicine by remote health monitoring of patients. Users get assistance from a doctor at anytime and anywhere via video conference. • Rapid crisis management capability rectifies breakdown in communication systems quickly, avoiding long MTTR. • Cloud services become considerably more reliable, functional and secure for the mobile users. • More interactive and cost effective online education. • Security: Monitoring, detecting, analyzing and preventing worms and viruses on wireless, and mobile networks combined would be more difficult, challenging. • Many operators: A large number of network operators are expected to co-exist and collaborate in the 4G - Networks. This will be complicated by versatile trust relationships between network operators. • Infrastructure: New 4G frequencies means new components in cell towers are required. • New Handsets ad PDAs: Consumers are forced to buy a new device compatible with the 4G network. • Coverage issues: Rural areas and multistory buildings in metropolitan areas are not being served well by existing wireless networks. 4G has not yet overcome this challenge. The evolution from 3G to 4G has been planned, studied and implemented yet it has already been discovered that some countries are yet to implement the 4G. 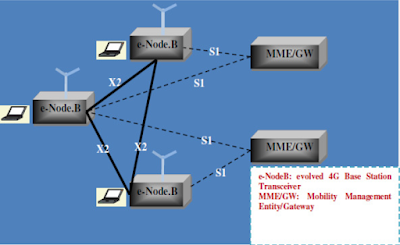 An important characteristic of performances are still unable to completely solve the unending problems of poor coverage, poor QoS, bad inter connectivity, and flexibility the 5G technology will be the ability of mobile devices to simultaneously send and receive information from cell tower, that things are not currently possible with older networks. 5G can be a completed wireless communication without limitation, delivering perfect real world wireless – World Wide Wireless Web (WWWW). 5G should be the driver for the ‘Internet of Things’ concept. Hope you learnt a lot from this article? Comment below if you have any confusion. Don’t forget to share this article with your friends. Also subscribe to get our latest posts.